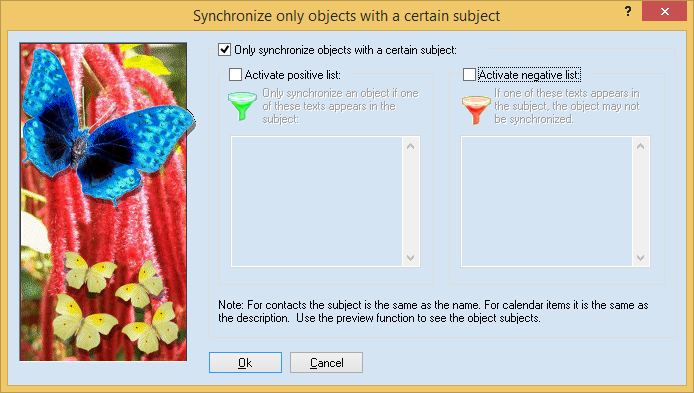 Activate this option to synchronize only the objects that have a certain subject. For example, if you are working in a team and mark your contacts with your name, you can choose to sync only your contacts. For this feature, you can configure a positive and a negative list. In each list you can enter any number of items, one item per line. If one entry appears within the subject of the e-mail the filter is triggered. If this is the case for a negative list, the e-mail would be excluded from synchronization; for a positive, it would be synchronized only in this case. You do not want to synchronize objects where the text "Spam" appears in the subject because your e-mail server marks them like this. To do this, simply enter this text into the negative list. The positive list stays deactivated. You are working in a team and sharing a central calendar. You want to synchronize this calendar from the central server to your notebook, but you only want to see your dates and those of one of your colleagues. All dates were marked with the initials of the person (in brackets). In this example you would leave the negative list deactivated and enter two lines into the positive list: "[TH]" and "[AK]." Furthermore, you should restrict the synchronization (in the folder configuration) to the calendar folder. Note: The word "positive list" may sound very friendly, but it means a very strict filtering. Often you will find the "negative list" more useful.